Kevin Durant's first two seasons with the Golden State Warriors went as well as he could have hoped. Not only did he help them win back-to-back titles, but he was named Finals MVP in each season as well. So it came as little surprise that Durant decided to re-sign with the Warriors this summer when he became a free agent. 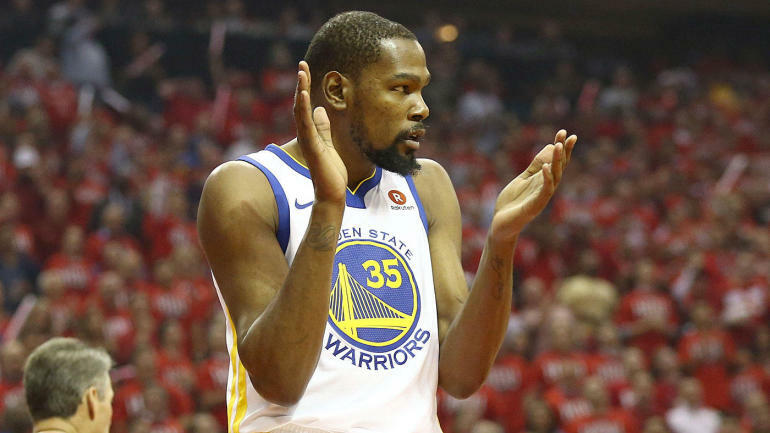 If this season goes to plan, with Durant helping the Warriors become the first team since the Lakers to three-peat, there's a good chance he'll stick around even longer in the Bay Area. But for a number of reasons -- his history in free agency, the fact that he essentially signed just a one-year deal this summer, some weird vibes between him and the rest of the team and the general state of how the NBA media ecosystem works -- people are already talking about what he might do next summer when he can once again become an unrestricted free agent. "When they don't know, when people really don't know the end, the conclusion or why I did something, they're going to always speculate and create stories and clicks and that's only going to make me more upset. So I'd just rather keep it open and transparent with you." However, this doesn't mean that Durant is going to spend the season giving you day-by-day updates of which team he's thinking about playing for. He wants to stay focused on the task at hand, which is winning a third straight title. "I dealt with it before," Durant said. "I just try to be as honest as I can. I'm not going to tell people what I'm thinking. ... Some days I think about my free agency, some days I don't. Some days I think about what my future looks like, some days I don't. I'm just human. That's just natural for me. But I can't sit down and talk to people about it because I want to keep playing, I want to focus on the season. "So I know the questions are going to come. I know a lot of people are going to speculate and print rumors and sources, but nobody's heard from me about anything, so it's just all speculation at this point." It's easy to see how this process would be frustrating for Durant, and why he wants to be transparent about everything -- especially considering what happened when he left the Thunder for the Warriors. At the same time, it will be tricky to thread the needle of being honest and open about the free agency process and also keeping the focus on the season.